Shepherd's Bush Empire, or the O2 Shepherd's Bush Empire as I should now grudgingly refer to it, is one of my favourite places in Shepherd's Bush, and in London. I love music and I really love good live music. It therefore follows that I save a little bit of my love for a good live music venue. In my opinion Shepherd's Bush Empire is a very good live music venue. Having hosted innumerable bands, artists and other acts (and even soon Gary Barlow's 40th birthday party) in its lifetime, it has a capacity of around 2000 which makes it a comparatively small live music venue in London (the (HMV) Hammersmith Apollo holds just over 8000 and the (O2) Brixton Academy just under 5000). When it comes to live music venues I will always prefer smaller and more intimate spaces (which is why I probably favour Bush Hall over the Empire, just slightly). Here comes the history bit. Built in 1903, unlike other London popular music venues, it was actually purpose built as a music hall as opposed to a cinema or theatre. It was designed by the same architect responsible for blessing our fair city with the Hackney Empire, London Palladium and London Coliseum. Many then popular music hall acts graced the stage in the first years including Charlie Chaplin in 1906. As with many buildings and areas around Shepherd's Bush and White City, the BBC inhabited the Empire and it became BBC Television Theatre in 1953. For nearly 40 years it was the home to a number of TV shows that are still fondly remembered by my generation; Jim'll Fix It, This is Your Life and The Generation Game. (More fascinating information about former BBC theatre/television studios can be found here - it really is quite remarkable how integrated the BBC was in and around W12 and W6.) The BBC and its cameras left in 1991 paving the way for it to become one of the most famous London music venues. Amongst the many bands to have played there many released very successful live albums recorded at Shepherd's Bush Empire including some of my personal (and my Dad's) favourites; local band The Who, local boy Gary Numan and the not so local The Wedding Present. Now as a Shepherd's Bush resident it is impossible for me to walk, run or be bus-ed past Shepherd's Bush Empire without glancing over to see who is next to headline. It then follows that I curse myself because I have missed a band I love, or I realise that the Bush will soon be hosting an influx of (delete as applicable) over-excited teenage girls/metalheads/checked shirts/emo-fringes/rooting-tooting-country-music-cowboys (*delete as applicable) and I plan my escape. Depressingly I have only been to Shepherd's Bush Empire on three occasions for gigs, with my first visit being embarrassingly recent. (It was about 3 years ago on a bizarre date with an Irish guy I barely knew and my brother and his girlfriend who I thankfully did know slightly better.) The band were the very brilliant and amusing We Are Scientists. My second visit was last year to see the delicious Paloma Faith with J of West Hampstead Life fame (I was also treated to a pre-gig kebab at Woody's Grill - a perfect Shepherd's Bush evening!). Ms Faith did not disappoint both vocally and visually with her stunning outfit choices. And finally I was there fairly recently with a bunch of mates to see a band I lusted after in my teens, Ash. So far Shepherd's Bush Empire has treated me and my love of music well, but it is certainly a local venue I take for granted and one I want to frequent more often. I am now looking up up-coming artists. Though tempted by the likes of Europe and Shakin' Stevens (something for everyone!) and maybe too late for The Walkmen, I am tempted by Cee-Lo Green (someone who I've loved since his Goodie Mob days and pre Gnarls Barkley albums). It did sadden me a little that there was only generic information on the O2 Shepherd's Bush Empire website about its history and no reference at all to its worthy purpose as the BBC Television Theatre. I think it's important not to overlook the history of these places. I am reminded of how sad I was when it was decided to demolish the similarly sized venue London Astoria (RIP) a few years ago. It would certainly be heart-breaking, for both W12 residents and music fans alike, if the Empire was ever to face such a fate. I suppose then, I shouldn't be so quick to ignore the O2 in O2 Shepherd's Bush Empire if it is keeping a well-loved part of both a local community and a wider music community alive with the sound of music. Yes. I'm a big fan of the Shepherds Bush Empire. Not least because it is the closest venue to my apartment at a mere 10 minute walk, but because it is the perfect size and capacity for seeing a band perform to a medium/large audience. I've frequented most of the other iconic London venues including the (sadly no more) Hammersmith Palais, and London Astoria. 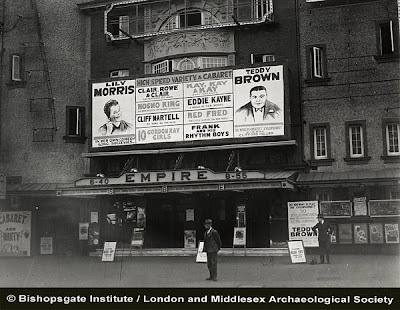 But the Shepherds Bush Empire remains my favourite. Great sound, great vantage points (tip: Level 1 balconies). Small enough not to be rammed with thousands of people compromising the intimacy of the gig, yet big enough to attract some great bands too - and occasionally you get some super huge bands doing intimate fan-only secret shows (eg. Rolling Stones / Muse). I'm very much looking forward to seeing Ani Difranco there next week, and the Descendents in April. Big up the Shepherds Bush Empire.